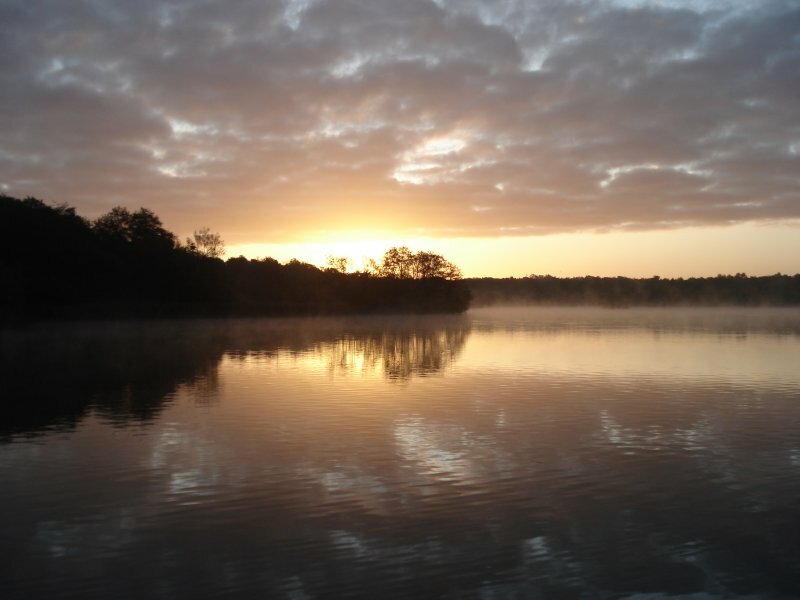 The results of the Fleet Pond Society (FPS) Photography Competition for 2009 were given at the FPS Annual General Meeting held in February this year. The full results of the competition (winners and highly commended) are given on the FPS website, here we give just the winners in each of the three categories: Birds, Work & Play and Sunrise/Sunset. 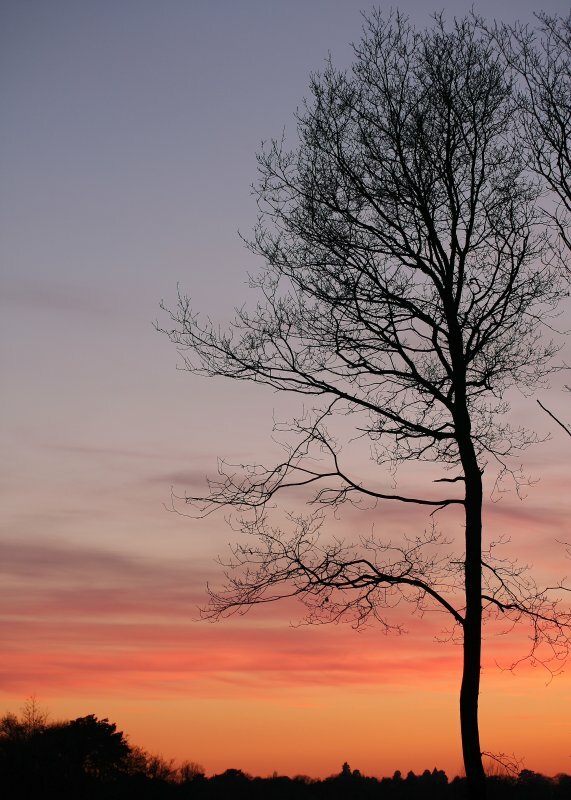 The competition was judged by Richard Warburton who is a local professional commercial photographer, based in Church Crookham. He is a member of the British Institute of Professional Photographers. Please click each photo for a larger version. We are in the process of setting up the competition for this year, 2010. If you have any views or ideas on how we could do things differently or better we would be delighted to hear from you. Please leave a comment below this post or else email me. 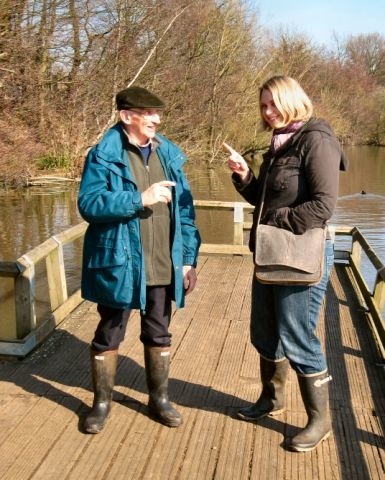 Planning for our exciting event on 22 May began today when Laura Hill, the OPAL Coordinator at Imperial College visited the Pond to discuss the basics for our joint event to celebrate International Biodiversity Day together. She was checking out what we had to offer and was well impressed with this little watery gem of ours. 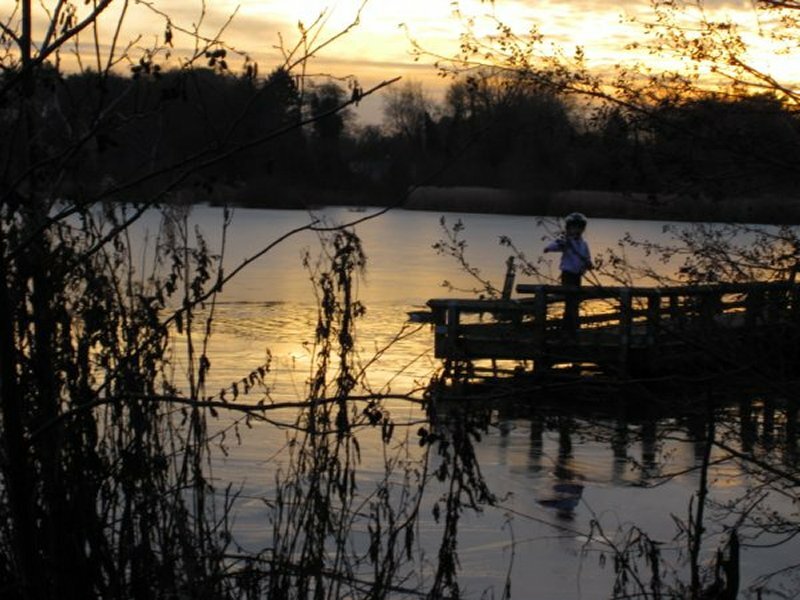 We’ll be running a wide variety of nature-based activities with a wide variety of national and local groups at the Picnic Spot as well as Boathouse Corner and The Green. Fleet’s ‘Captured Moments’ photographers will be recording the day for us. So please put it in your diary! 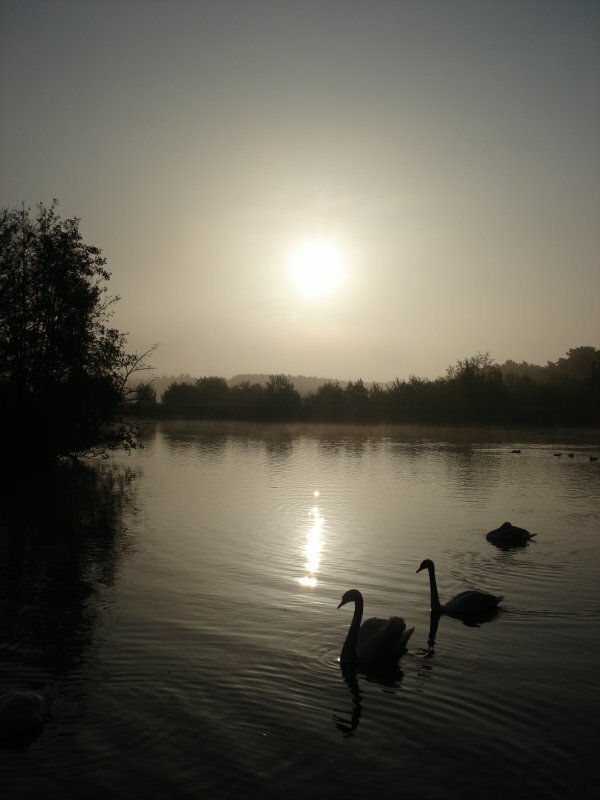 For the first step on the path to a brighter future for Fleet Pond see here. 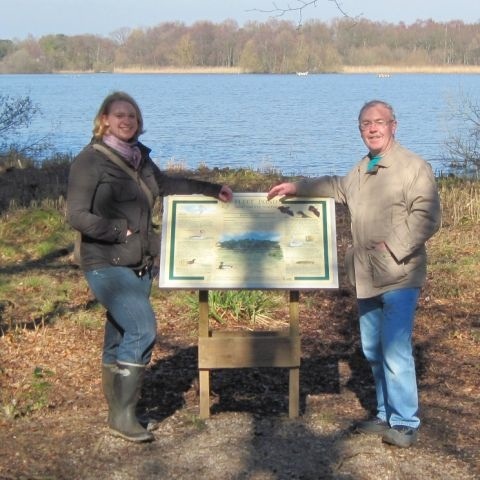 We plan to tackle the bat corridor between Gelvert Glade and Fugelmere Marsh (see map on About page above). Work has been done to open the woodland but we have not quite broken through to the marsh so there will be a few more young trees to fell. 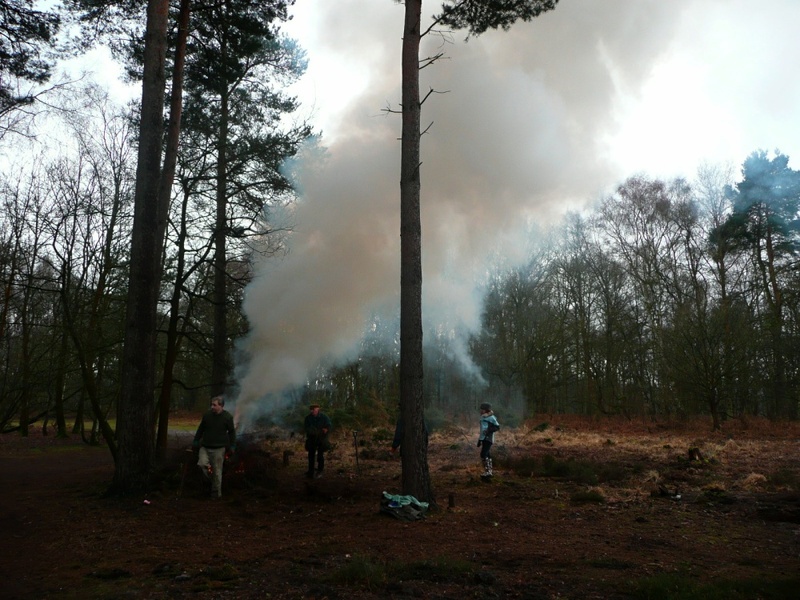 The task on 14 February was to tackle the birch on the Dry Heath. This was a follow-on from the Carbon Army Challenge task last December. We were joined by Andy Golder and his team of Wildlife Explorers, complete with assistants and parents. 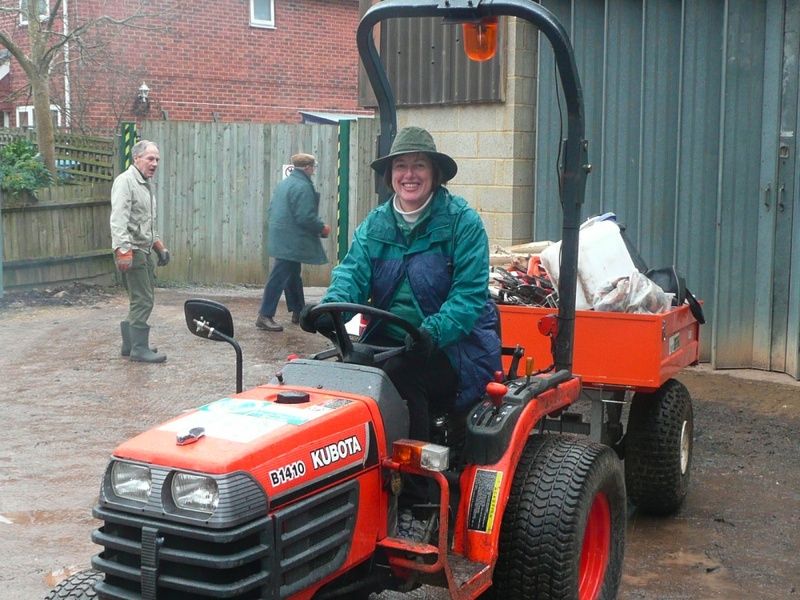 Cathy, A New Driver For The Tractor! 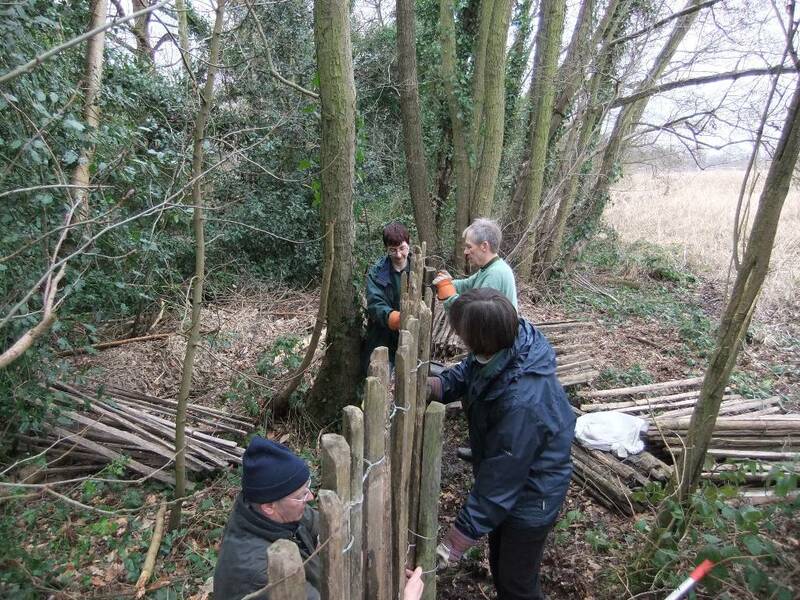 On a cold Friday morning in February, 5 members of the “Last Of The Summer Wine” team (Terry, Nick, Cathy, Mandy and Geoff) undertook a task erecting fencing to protect nesting sites in the western reedbed from intrusion by dogs (and people). 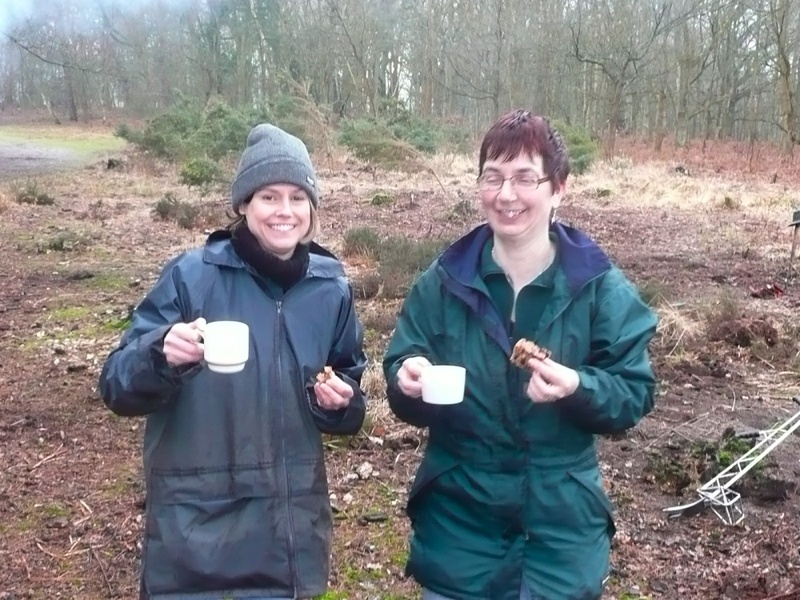 The group met at 09.30 at the Rangers’ Workshop and worked until 12.30 with a short break for coffee and cakes. This friendly team meets on an ad-hoc basis at 3 to 4 week intervals to take on small to medium size tasks which the rangers find hard to fit into their schedules. This is in addition to the regular conservation days which take place on the second Sunday of each month (excluding July and August). There is always room for willing pairs of hands to help out. All tools and gloves are provided and no previous experience is needed. Anyone interested should contact Terry Austin on 01252 624925 (tsandja2010@live.co.uk) for further details. There are 630 species of spider in Britain, of which 130 species were recorded during a 1998 survey at Fleet Pond. Spiders come in many shapes and sizes with each group different from the rest. Hunting techniques vary widely across the different groups with not all spiders making webs to catch their prey. 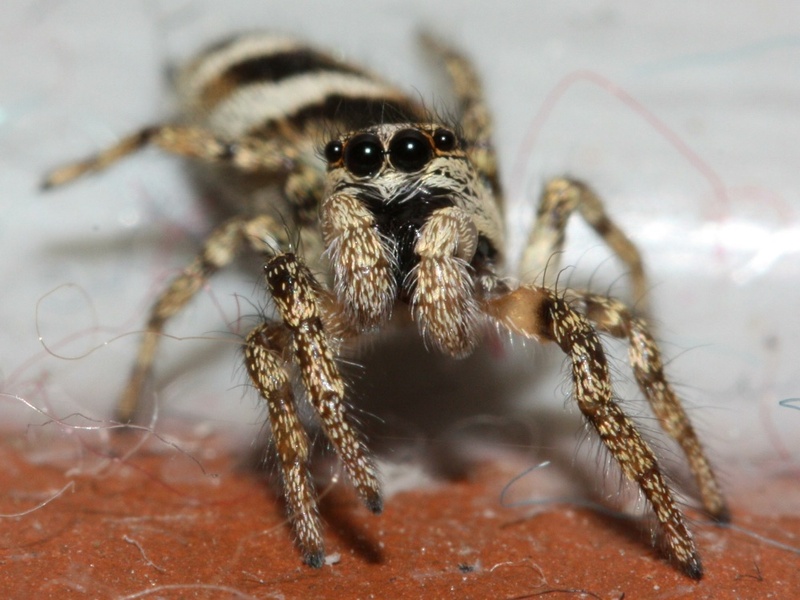 The Jumping spiders for example have two very large eyes at the front of their heads to allow them to hunt visually and pounce on their prey. These eyes are highly developed with binocular vision, excellent focusing ability and are also properly sensitive to colour. Some species such as the Woodlouse Eating Spiders are specially adapted to their prey. These spiders have extremely large jaws which allow them to pierce the tough outer body of the woodlice. For those spiders that spin webs, there is great variation in the types and shapes of webs spun. Some are round, triangular or even tunnels of silk in which the spider lies in wait for prey. Spiders can produce 7 different types of silk from 7 different glands, all of which are used for different purposes. Although they do not have all 7 glades, spiders usually have at least 3 or 4. Fleet Pond has a great variety of spiders, and several rather fascinating and unusual species are found here, a few of which are described below. The Water Spider Argyroneta aquatica is a spider that lives an aquatic lifestyle. It has been found at Fleet Pond in amongst the Bog Bean plant which grows in patches around the Pond. 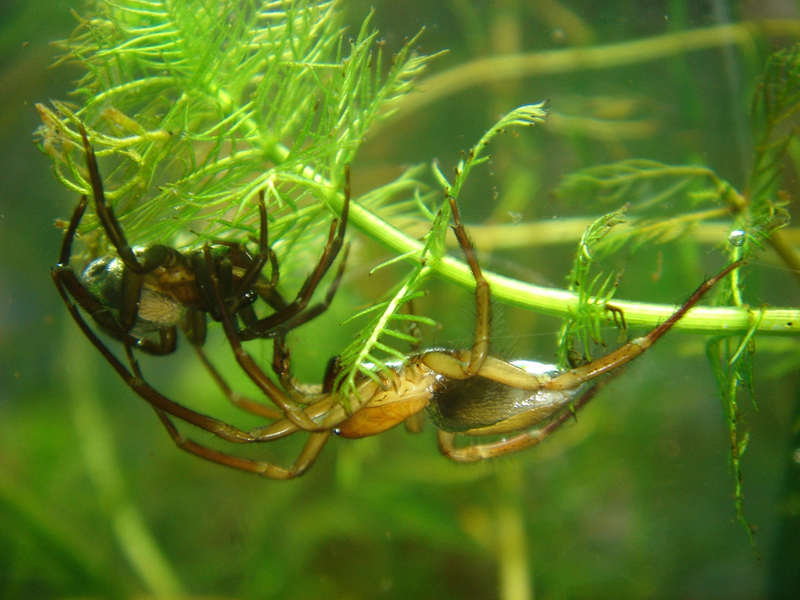 They spin a retreat web under water amongst vegetation, as shown in the photo, which is then filled with air which the spider collects from the surface. Oxygen levels are maintained within this retreat by diffusion from the surrounding water or from bubbles of oxygen from the surrounding vegetation. Mating and egg laying takes place within the web. Prey is also brought here to be eaten and is only rarely taken to the surface. Prey usually includes aquatic invertebrates and occasionally small fish. 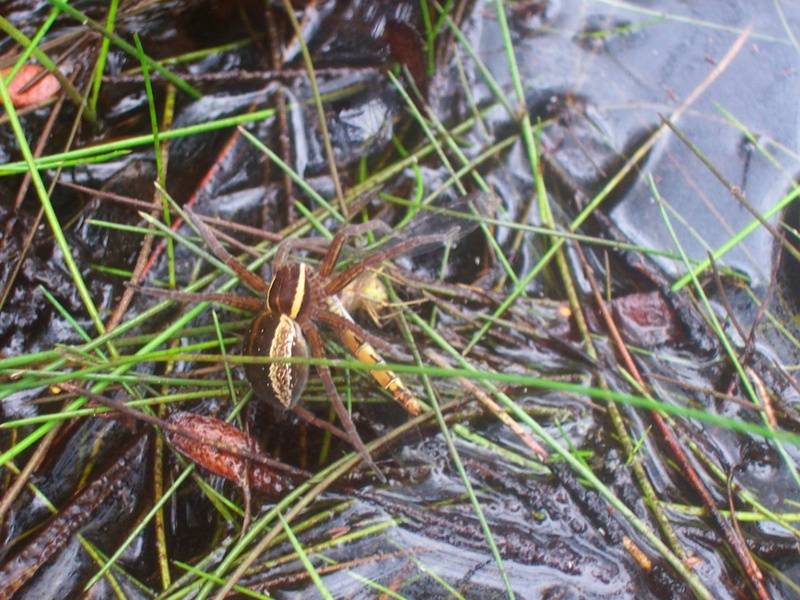 Fleet Pond is also home to Britain’s biggest spiders, the Raft Spider Dolomedes fimbriatus. This species lives in amongst vegetation in wet areas such as wet heaths and fens and, as its name suggests, can float on top of water like a raft. They hunt by sitting in low vegetation with their front feet on the surface of the water ready to pick up vibrations made by prey which are then pulled out of the water and eaten. Prey can include insects as large as dragonflies, tadpoles and even small fish. 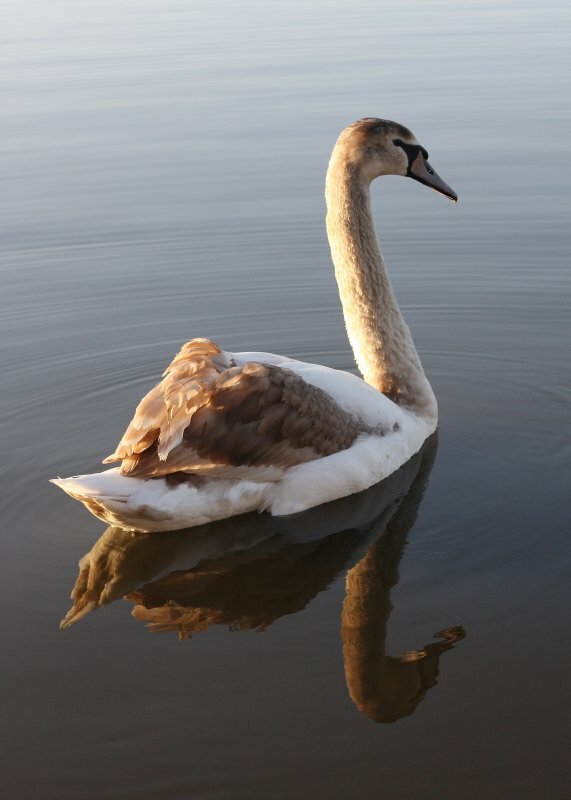 Prey can also be chased across the surface of the water or through vegetation. 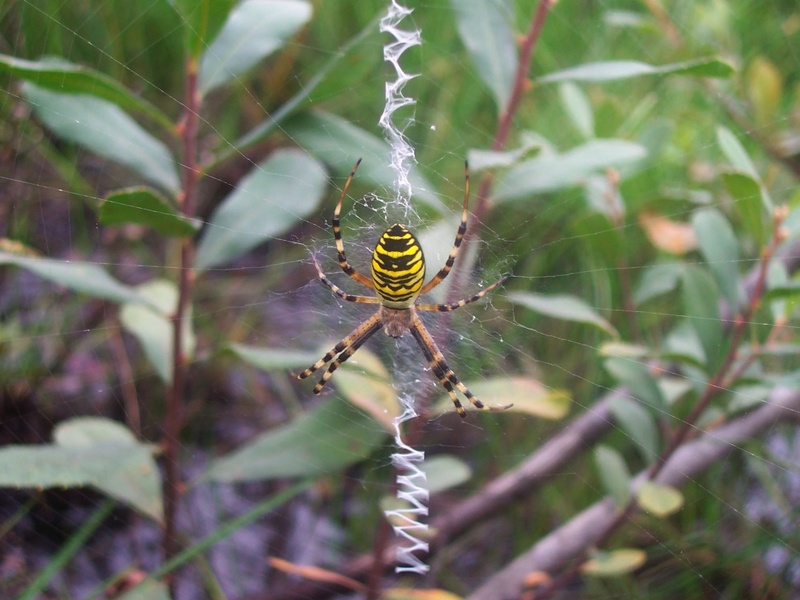 The Wasp Spider Argiope bruennichi is a very distinctive and beautiful spider with yellow and black stripped markings. This species was once confined to the south coast of England but has been slowly spreading north. It is an orb web spider which spins a circular web in low vegetation with a distinctive zigzag pattern above and below the centre of the web. It catches flying insects such as crickets and grasshoppers. The female’s egg sack is also the largest of any British spider, measuring 25mm across. Photo credits: Wikipedia (first), Wikipedia (second) and Joanna Lawrence (third and fourth). You are currently browsing the Fleet Pond Blog blog archives for March, 2010.